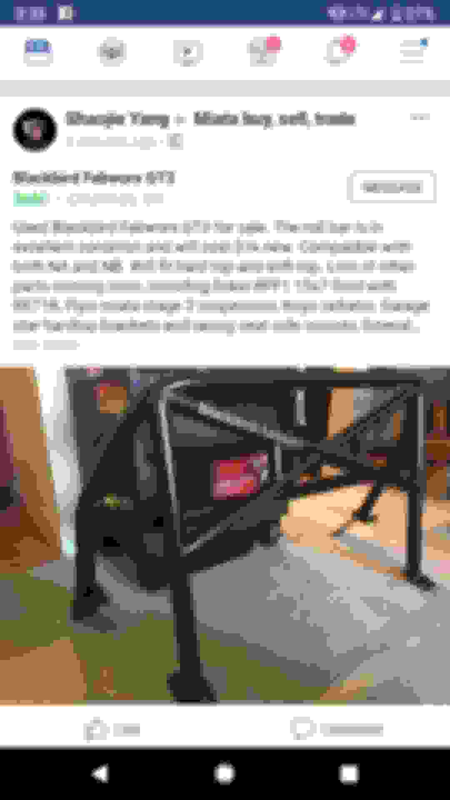 WTB Blackbird Fabworx Roll Bar - Miata Turbo Forum - Boost cars, acquire cats. I'm just praying I can grab one of these a little cheaper than new. Help me out here. I'll assume you're looking for one sooner than later, but I'll most likely be selling my Blackbird Fabworx NB single diagonal bar in October when I send my car off to get caged. Might be a little far from you to come grab anyway though, I'm in Virginia. My idea ETA would be july this year. I want to have it installed before MATG. Just saw this pop up on almighty bookface. Drop him a line. Thats a solid find. Let see if I can beat the crowds to it.